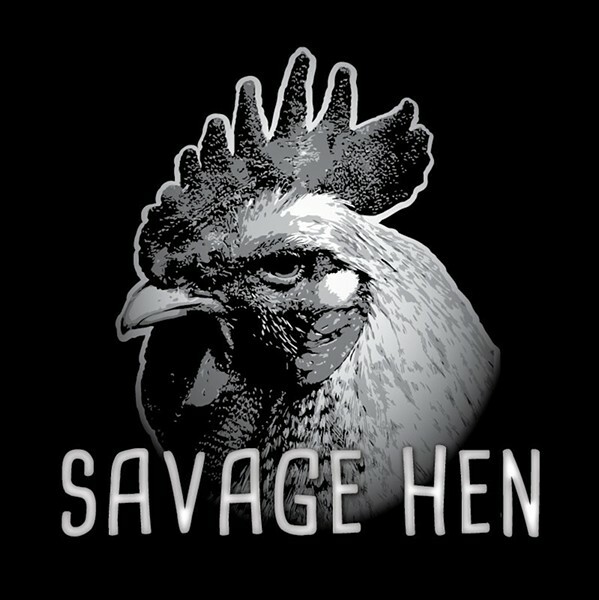 Savage Hen are a three-piece demolition unit from Burlington who have been making a name for stripped-down, high-volume rock operas. Or, as they call their music, "Heavy Doom Groove Sarcasti-Core." In layman's terms, that boils down to ambitious songwriting executed live onstage with only bass, drums and vocals. This is a setup that simply should not work. Yet on the trio's 2015 release, Side A: Local Lore, it really, really does. If you've only got two instrumentalists onstage, they'd better be damn good. Fortunately, the team of bassist Matt Hagen and drummer Jeremy Gartner are both certifiable hell-raisers. (They're credited in the liner notes as "Power Riffs" and "Power Bangs," respectively.) Gartner does a virtuosic job of filling things out sonically, keeping things interesting while holding it all down with the precision of an atomic clock. Hagen's bass tone is indebted to a very specific '90s California sound. A paternity test would probably indicate a mix of Flea from Red Hot Chili Peppers and Tim Commerford from Rage Against the Machine — indeed, all three members of Savage Hen play in the local Rage tribute band Burning Monk. Both Flea and Commerford were frequently tasked with filling out the mid-range in addition to holding down the bottom end — in essence, supplanting rhythm guitar. Hagen consistently delivers primal, catchy riffs with just enough complexity to hold interest without wandering anywhere too ... well, jammy. Jack Kubera is credited as "Storytelling," which is perhaps more appropriate than the more conventional "vocals." His delivery is surprisingly fluid on this five-song set, ranging from the distinctly Layne Staley sound of "Alabama Swamp Skin" to a faux-British, early Pink Floyd intonation throughout closer "The Wolf." For the most part, Kubera keeps things very punk on the microphone, all spit and snarl. But there's a lot of potential range there. Chops aside, Savage Hen's real secret weapon is dynamics. They ably execute absolutely killer hooks and breaks. But they know how to frame those highlights in order to make them even more powerful. You can hear a lot of process, and practice, behind these tracks. It helps that you can also hear everything. The project was recorded at Robot Dog Studio in Williston, and engineer Ryan Cohen does an admirable job of getting out of the way. It must have been sorely tempting to add a billion or so embellishments to such a sparse sound, but Side A stays very true to Savage Hen's live show, opting only to polish the mix to perfection. This short EP — technically, it's the first half of a forthcoming debut album (things are getting even weirder in the music industry these days) — is a perfect introduction for such a unique local anomaly. Savage Hen have undeniable chemistry, songwriting talent and style to spare. Here's hoping they stick around long enough to really explore the monster they've created. Or at the very least, just release Side B. Side A: Local Lore by Savage Hen is available at savagehen.bandcamp.com. The band plays Metal Monday at Nectar's in Burlington on Monday, March 7, with Bell Witch, Chalice and Wrekmeister Harmonies.